Game's been out since July, But it always crashed when I tried to open it. Now a recent update has allowed me to play. Pretty good game! Note that this game requires progression to see the cars in color. So it will be slowly updated. Oh my god I've got my work cut out for me. New update with 30 new cars. I haven't even done the old ones yet! This game has some pretty well designed cars for the style of the game. I've seen some of the other vehicles in images on Google. There's a Mercedes-Benz G63 AMG 6X6, a Hummer H1, a Hummer H2 police SUV, the Mini Cooper seen in the cover image, the Mutt Cutts van (a 1984 Ford Econoline) from Dumb & Dumber, a 2008+ Ford E-350 ambulance, Mercedes-Benz SLS AMG GT Final Edition (it's got the blacked out hood, which only the GT Final Edition had), a Toyota forklift, and some sort of Range Rover, the DeLorean Time Machine from BTTF, among others. I must agree. 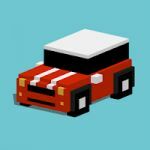 These are the best block-style cars I've seen in gaming. . I will do more tonight. Still progressing. Here are Hovercraft and Alien. New update but bad news! The game now will no longer open. It crashes to my home screen whenever I open it. I've sent a problem report to the devs, But god knows if they'll care. Well I had to delete this game because ever since 2 updates ago it crashes when I open it. So that cool. someone else is gonna have to finish this page. I've just added it as well as a batch of other cars. And I apologize for the terrible quality pics. Mind if I replace a few of them? I have unlocked some of those cars, so I have higher quality pics in color. Car named "Bumpy" wasn't accepted... Just like Hovercraft and Alien. Alien may be a flying machine, But if you flip over Bumpy or Hovercraft, there are wheels underneath. Meaning it canbe listed as a car. Similar situation on Ridge Racer 7. A car has wheels, but you can only see them at certain times. That is just a status system that determines how powerful the weapon is. In no way are the games similar. There are millions of others with the same concept. Why is Egypt in the tracks and places list listed as South Africa? South Africa is far from Egypt!